sweetness and salt | I Should Cocoa! I adore peanut butter and chocolate. Reese’s peanut butter cups are my second favorite candies. My favorite candies are Reese’s peanut butter Easter eggs which have the absolutely perfect ratio of salty fluffy peanut butter to creamy chocolate shell. Those, however, have to be hoarded in the spring to last during the leaner months. So in search of a suitable year-round fix, I came upon this Martha Stewart recipe for rich, fudgy, decadent chocolate brownies tempered with ribbons of salty, creamy peanut butter. The recipe uses a sweetened, fluffy peanut butter filling rather than the straight-from-the jar sticky salty stuff which makes the texture wonderfully light compared to the dense brownie, and reminds me of a Reese’s. These were perfect for a hiking trip to see waterfalls in Big Basin, a late summer potluck cookout with friends, and even for sneaking into the movie theater for a frothy comedy. No hoarding, though. 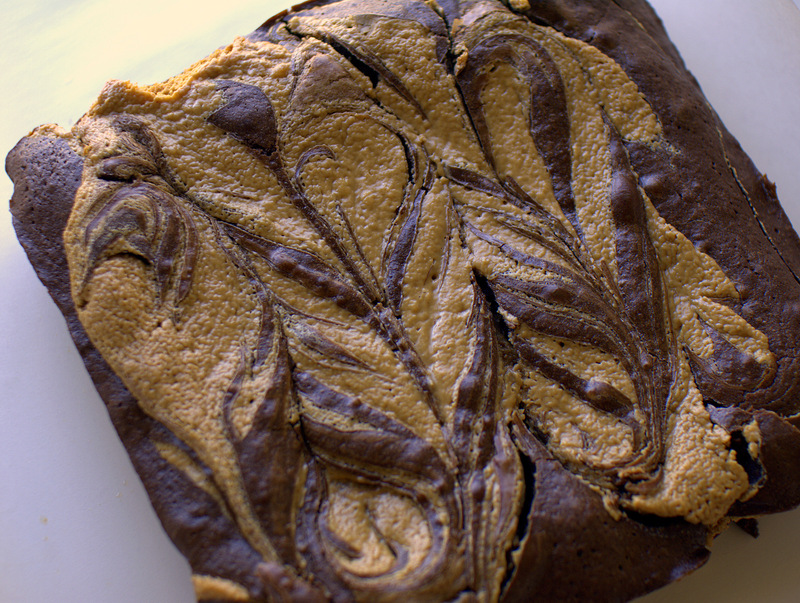 This entry was posted in baking and tagged baking, brownie, chocolate, peanut butter. Bookmark the permalink.